In his speech last week announcing the strikes in Syria, President Trump spoke passionately about the suffering caused by the alleged chemical attacks. PRESIDENT DONALD TRUMP: The evil and the despicable attack left mothers and fathers, infants and children thrashing in pain and gasping for air. CHANG: Humanitarian groups listening to that see a contradiction here. They say if the administration cares so much about Syrian civilians caught in this conflict, why has it only allowed 11 Syrian refugees into the country so far this year? NPR's Deborah Amos has written about this, and she joins us now to talk more about it. Hi, Deb. CHANG: So the U.S. Ambassador to the U.N. Nikki Haley was asked about this on "Fox News Sunday" yesterday. And she said that she's traveled to Jordan and Turkey and spoken to Syrians there. Here's what she said she heard. NIKKI HALEY: Not one of the many that I talked to ever said we want to go to America. CHANG: Is that true that very few displaced Syrians want to come to the U.S.? AMOS: Ailsa, I've talked to so many refugees and they always say I just want to go home. But that's really not the point. I checked with refugee advocates who say that there are still thousands of Syrians waiting for resettlement. They've signed up with the U.N. refugee agencies in Jordan, in Lebanon and Turkey. Some of them want to join family members who have already been resettled here and others have signed up because they say they can't go home and they meet the international definition for resettlement with a well-founded fear of persecution because they're members of a persecuted minority, they belong to a persecuted group or they're vulnerable if they return home. Those are torture victims, those are LGBT refugees, those are single women head of households. And those are the people who have signed up. CHANG: Can you just put the 11 refugees figure into context here? I mean, what is the normal? How many Syrian refugees have come in past years? AMOS: You know, under the Obama administration in those first years of the Syrian revolt, the numbers were really low, somewhere in the thousands. But by the last year of the Obama administration, more than 12,000 were resettled. This year, we're talking about 11. CHANG: And why are the numbers so low this year so far? AMOS: Refugee advocates say that it's bureaucracy. That's what's slowing down the process. There hasn't been a security interview in the Middle East since President Trump took office. So what's happening is those numbers are just clearing the backlog of refugees who have gotten their security clearance. Scott Cooper with Human Rights First explains that there are also some new extreme vetting procedures in place. SCOTT COOPER: A person has to put down every address that he or she has lived at for the last 10 years and then every relative and their contact information. That is a bit much because you don't know where your relatives are. And if you've been fleeing conflicts, the ability to articulate, you know, where you've lived for at least 30 days to the last 10 years - I mean, I was in the military and it's difficult for me to compile the addresses that I lived at for those periods of time. CHANG: I mean, Haley herself, when she was responding to questions about the small number of refugees coming into the U.S. this year, she pointed to the vast amount of funding in aid that we give to Syrians. 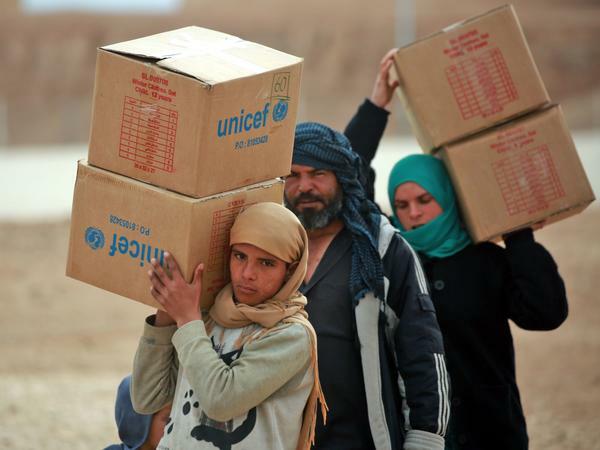 So if we are sending billions of dollars of aid to Syrians, why do we need a refugee program? AMOS: You know, administrations have done both. The Obama administration sent aid about the same amount that the Trump administration is sending and resettled the most vulnerable. It's the Department of Defense that has been the biggest backer of continuing this refugee resettlement project. And what they argue is that this sends a signal to our allies, Turkey, Lebanon, Jordan. They have the big burden. Turkey has 3 million Syrian refugees, Jordan 1 million. And it's to say to them, OK, we're taking just thousands, but we know that you are under strain and we are doing our part. We recognize what's happening to you. And this is the argument that the DOD has been making to the White House. AMOS: Thank you. Transcript provided by NPR, Copyright NPR.